A double blind clinical study was conducted on 104 adult male and female subjects for six months to investigate the effect of dentifrice containing 0.2 percent triclosan and 0.5 percent pluronic in a calcium carbonate base for reduction of supragingival plague and gingivitis as compared to a placebo dentifrice in a calcium carbonate base. The results support the conclusion that a dentifrice containing 0.2 percent triclosan and 0.5 percent pluronic in a calcium carbonate base is clinically efficacious for the reduction of supragingival plaque and gingivitis. Cleft lip and cleft palate are two of the most common congenital disabilities. It has received scant attention in India, and does not get the scrutiny it deserves. Its variations in expressions were not recorded. Owing to its high incidence, even the slightest reduction in risk could result in significant public health benefit. This article strives to project the relationships between factors and facts of cleft lip and palate. Leprosy is a chronic infectious granulomatous disease caused by Mycobacterium leprae. 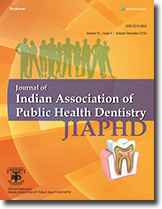 The aim of this study was to assess the oral health status and treatment needs of patients affected by leprosy in Bangalore City. This study was conducted at 3 leprosy centres in Bangalore City and a total of 211 patients were interviewed and examined using WHO Oral Health Assessment Form (1986). Among 181 patients with deformity of hands, feet and eyes, 39.3% had calculus, 34.9% had shallow pockets and 6.8% had deep pockets. The mean number of healthy sextant (1.44) was found to be more in patients without deformities compared to patients with deformities. Mean DMFT score was 5.7 and the mean number of decayed teeth, missing and filled teeth is 2.16, 3.53 and 0.009 respectively. Majority (45%) required extraction and 41.7% required dentures. Extraoral manifestations like paralysis and lepromas were found in 2.8% and 1.4% patients respectively. Periodontal disease and dental caries continue to present unique problems in the dental management of this patient population because the chronicity of oral diseases compounds the primary physical disability.